Noam Chomsky and Michel Foucault are described in this book by Fons Elders as ‘tunnellers through a mountain working at opposite sides of the same mountain with different tools, without even knowing if they are working in each other’s direction.’ Human Nature: Justice vs. Power is the title of the debate, which originally aired on Dutch television in 1971. The title is taken from the stance that both men arrived at (or continued to entertain) into in the late stages of their careers. To reduce it to its simplest explanation—a job that the title of the book has already prepared us for—, Chomsky tends to think that some sense of justice is responsible for human nature while Foucault tends to think that programs of power play more into human behavior. One might be tempted to pin the whole occasion down to a manifestation of an ongoing war between foundationalism and hermeneutics, Chomsky being a likely tie to the former and Foucault a likely tie to the latter. However, nothing between these two thinkers is ever quite that simple. As Chomsky continues on insisting that certain attributes of human language and creativity stem from fundamental biological properties, we start to gather that this insistence has more to do with a scientific need to push forward with a theory in order to see if it stands or falls in some provided context. This also gives Chomsky a chance to remain optimistic about the nature of man by postulating that some notion of justice or, at least, a notion of ‘better justice’ is what drives human nature. This also gives him the opportunity to remain fairly constant through both subjects—creativity and politics. On the subject of creativity, Foucault seems to disagree with him very little or only in small ways, while remaining suspicious of the inherent logical movement of Chomsky’s assumptions. They split on Descartes and the mind, and the nuance of this split is representative of the paradigmic relationship that these two thinkers have with the subject matter. The subject of politics is where Foucault is at his most rigorous. When asked why he is interested in politics, the most basic answer he can provide is that it would be far stranger for someone not to be interested in politics, at which point it would be justifiable to ask, ‘Well, damit, why the hell not?’ A self proclaimed ‘Nietzschean,’ Foucault’s specialty is in the genealogies and pedigrees of certain ideas and assumptions. Through socio-linguistic turns, through the intellectual extracts of different sets of phenomena and the inter-subjective dialogue possible between them through different texts, Foucault made a career out of constantly trying to step outside of the historical contexts in which we’re thrown and creating brand new narratives in such a way that they would read as though they were things hidden since the beginning of man. The most fundamental disagreement happens late into the debate, in the political section, in which Foucault postulates, not without hesitation as though trying to avoid an impolite subject, that the notion of ‘justice’ was created and then perpetuated by oppressed classes as a justification for economic and political power. Chomsky defends justice as being sought as a network of basic human needs like love, decency, kindness and sympathy, whereas Foucault’s view of justice, Chomsky claims, is very specific to only certain political situations and doesn’t take into account instances like two countries going to war—One is left to choose one side, which reduces the objective to a level of basic human needs and the mutual striving of the citizens to achieve it for one another as well as themselves. Often, Foucault, eager to escape essentialist trappings, always comes back to the subject of power as a means to clarify, though he does seem to rest there much the way Nietzsche did. However Foucault does deserve credit for defining Power along more complex lines than the Nietzschean idea of power as ‘the sensation of having overcome,’ or the force by which every set of phenomena can be reduced—‘will to power.’ Foucault takes it further by saying that power is not simply a way of measuring the ways in which the strong constrain the weak but that it can also be manifested through one culture’s influence of educational tools and medical practices. This turns Foucault around from what some have been tempted to call a pessimistic reading in favor of a cooperative project that coincides with that of Chomsky’s—to work on a more livable world for all. Though no real conclusion is reached between them (as one might expect), it is an interesting look at a very important project for humanity, even if the means to get there are a bit hazy. Tagged with Noam Chomsky, books, michel foucault, debate, human nature, book reviews. May 12, 2017 by Shane Eide. 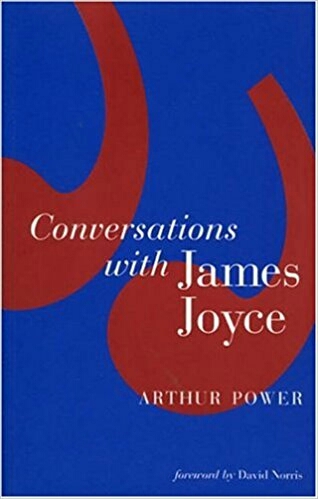 The foreword to this edition of the book is determined to, at once, paint its author as a genius worthy of Joyce’s friendship and to divulge to us the most sensational instances of their meeting before we even get a chance to read about it ourselves. Forgiving the clumsy beginning, we’re then introduced to a token of this particular genre whose most remarkable predecessor—and, surely, a direct model was Conversations with Goethe. Like Eckermann’s Goethe book, Arthur Power’s book is autobiographical in structure but slight on the ‘auto’ at just the instant when the star-artist arrives on the scene of our narrator’s life. At this point, minimal narration segues into a lot of lit-talk. Though the forward by David Norris suggests that Mr. Powers is humbly portraying a younger, bohemian, ‘romantically-inclined’ version of himself in the shadow of a great genius, one can’t help but think that perhaps Mr. Powers thought, in fact, that he was the one best equipped to match wits with the great Joyce. After all, we’re only warned in the beginning by Powers, ‘My point of view has changed and coincides more with his, but such was it then, and as such I have left it.’ As close to Joyce’s mind as Powers’ mind might have become later, Powers never gives the reader any direct indication that he later disavowed his hatred of Ulysses. He preferred Joyce’s previous works which he thought were more ‘romantic’: Dubliners and A Portrait of the Artist as a Young Man. The important thing is not what we write, but how we write, and in my opinion the modern writer must be an adventurer above all, willing to take every risk, and be prepared to founder in his effort if need be. In other words we must write dangerously: everything is inclined to flux and change nowadays and modern literature, to be valid, must express that flux. InUlysses I tried to express the multiple variations which make up the social life of a city—its degradations and its exaltations. In other words, what we want to avoid is the classical, with its rigid structure and its emotional limitations. The mediaeval, in my opinion, had greater emotional fecundity than classicism, which is the art of the gentleman, and is now as out-of-date as gentlemen are, classicism in which the scents are only sweet, but I have preferred other smells. And we get plenty of other smells. Not many other novels before or after Ulysses feature a prominent scene with its main character on the john. Arthur’s experiences with Joyce are set almost entirely in his living room. Much of Joyce’s lifestyle is hardly surprising to read about. He hated all things bohemian. He didn’t like to go to parties and he didn’t feel comfortable around people. —I am not surprised, he said. He nearly made me want to commit suicide too. Unlike Conversations with Goethe, which is made up of warm, congenial insights into many subjects between friends, Conversations with James Joyce is made up almost entirely of literary arguments. It is impressive that Powers was able to honestly capture (to the best of his memory) the biting, sarcastic quips that Joyce reserved for the former’s favorite writers. When Powers asks if Joyce is interested in Dostoyevsky, he replies, ‘Of course.’ Dostoyevsky, in fact, earns a brief but high place of praise in this book, probably higher than most other names mentioned. He is the man more than any other who has created modern prose, and intensified it to its present-day pitch. It was his explosive power which shattered the Victorian novel with its simpering maidens and ordered commonplaces; books which were without imagination or violence. The book ends abruptly on an unfortunate and sad, yet totally puzzling note—a rift in their friendship. What’s puzzling about this rift is that it is not only vague—having grown in the soil of Joyce’s ‘ill humour’ which came about one night over a meal—but that seems to rest almost entirely on a gross misinterpretation of a statement that Joyce made to lighten the mood. The fact that Powers qualifies this callous statement by mentioning his not being a family man, by his irritation at Joyce’s alleged self-perception, and also by his unspoken agreement with Beckett of the world that ‘It had gone on long enough,’ leads one to assume that, inevitably, Powers was of the mind that his own position and attitude was justified. What would seem to be his apparent inability to read the situation years later, or at least, to see how it would appear to the common reader on paper, strikes this reader as a comical emotional blind spot. It had not ended, but had lessened as so many friendships lessen when distance puts its cold hand between them, damped as they are by circumstances and time, and by differences of personality. A personality can fuse with another personality for a time, but when that time is over we gradually re-enter the Solitude of ourselves. Then all that remains is the memory of the fire which once warmed us both, and it is fragments of that memory which I have tried to reconstruct. This memory reconstruction, this fragment, this already brief friendship, is the closest thing we have to discovering Joyce the man. But such is surely as Joyce would have preferred it: that he left behind, not traces of his life, but only his work. Tagged with books, literature, irish literature, James Joyce, book reviews. May 10, 2017 by Shane Eide. Tagged with books, Henderson the rain king, literature, Africa, saul bellow, book reviews. May 9, 2017 by Shane Eide. Alastair Hannay’s Kierkegaard is, over all, an exemplary contribution to the very peculiar genre that is the biography of the philosopher. Tagged with books, biography, book reviews, kierkegaard. May 8, 2017 by Shane Eide. Whether read on scrolls, leaves, pages, napkins or computer screens, every reader needs to take a break now and again. Perhaps, before the art of punctuation was invented, the ancient readers approached texts intuitively and paused where it suited them. Perhaps they were bad at this and that’s why punctuation was invented. A period is a nice place to take a breath. But what about stopping for the night? Bookmarks only work to an extent. Chapters are much more congenial, showing that the writer is in agreement with the reader and that the book must, at some point, be set on the nightstand and the light shut off (depending on the kind of reader you are—Some people blaze bleary-eyed through a book and come out the other side of the morning tired at work or school or gym). But are chapters not a little tyrannical, too? It is by them that the author tells you how to read the book. But then, one could argue, punctuation does much the same. Language tells us how to think just as thoughts tell us how to speak. The chapter, as a convention, seems to arise precisely from the means by which the book is published. In the nineteenth century, it was common for books to be published in journals. It was conducive to the medium that one chapter fit easily within the binding. It was usually meant to be consumed in one sitting like a television show today. Dostoyevsky in particular, along with a great many others of the journal-driven variety, wrote books featuring dozens and dozens of short chapters whose breaks would, by today’s breaking standards, seem wholly arbitrary. Every once in a while, the cliffhanger would take effect and an unexpected guest would walk into the room. The next chapter would immediately feature a description of the unexpected guest’s face or some exciting news he had to offer. Then other chapters would simply find their place between two pieces of dialogue, as if to trick the reader into a sort of maieutic excitement. With Beckett and Joyce, we reach an immensely unjournalistic kind of novel. The chapters are books in themselves, written as though to be consumed in one sitting though this is often impossible. A book like Gaddis’s JR,which plays with the theme of communication, is not split up by any chapters in the entirety of its 700 odd pages. Rather, the ‘breaks’ are densely written vignettes between bits of exhaustive dialogue which act as mechanisms to transition one scene and set of characters to another—the book being a series of literary French Scenes. Gaddis’s first novel, The Recognitions, though divided up more conventionally, is by no means conventionalwithin the chapter. In a chapter of this book, years might pass or days might pass, or perhaps a single meal which then turns into a meal months later. The second of two famous party scenes in the book runs to about 85 pages, making up the entirety of a chapter. Upon my second reading of the book, I realized with great amazement, after spending several hours on these 85 pages, that I was taking as much time on this party chapter as I would an actual party—a chapter written in real time. For some writers, chapter breaks are merely something cumbersome to fit in. Certain long-winded writers of epics are always itching anxiously for the place they can finally end their thought so that they can go on to the next. For other writers, the chapter is a source of salvation—a means to switch first-person perspectives or a means to include a little aside or to issue a complete narrative rupture. William T. Vollmann used fake chapters as a plot device in You Bright and Risen Angels by listing the names of unwritten chapters to give the reader an idea of what events take place after the actual book finishes. The Adventures of Augie March allowed itself all the voluptuous tendencies of the old big European books to ruminate on some philosophical idea at the beginning and endings of its chapters, though the chapters themselves are quite long. The Bible was chaptered and versed long after its writing. Perhaps writers who prefer to practice their craft off-the-cuff with no mind for cutting their work into marketable, bit-sized baby pieces would prefer the same for their own work. Others make an art of it. Often, the structure of a book may be determined by the way its chapters come falling out of the book like cards with so many clues on them.Wilhelm Meister’s Apprenticeship has a curious beginning. Several short chapters comprise one meal as Wilhelm tells his loved ones about his memories of puppeteeing with his peers as a child. These little pulsing spurts of story, broken up so frequently, were perhaps meant to act as a little selah in an introduction not labeled something so marketable, like ‘Prologue.’ It is asubterraneousintroduction, implied in the tone and pace of the text. As Goethe’s chapters get longer and longer, the fragmented story of puppeteering from the beginning suddenly struck me, while reading, as a strange memory, almost as though I was trying to recall a dream. I was able to recall all of the different, subtle shifts in perspective that this method of splicing awarded, which colored my view of the hero and how he acted for the longer stretches of text later in the book. If pausing is also about reflection, it is little wonder that we impose a book-like structure to our own lives. How often, when speaking of changes, do we ‘open a new chapter?’ The forms of life and the condition of the universe have, perhaps, already planted the chapter-structure in our minds. Are the seasons not chapters? Are hours not scenes? Are our lives not stories from which we would like to take a break now and again so that we might reflect on what they mean before entering them again? Perhaps the similarity is a bit unfair. With life, we don’t have the luxury of re-reading any of the chapters. Tagged with books, inspiration, writing, creativity. November 14, 2016 by Shane Eide. These days, fewer are the novels I pick up and read thinking anything other than, ‘Dear fiction, why can’t you be as interesting as nonfiction?’ Seeing how I write fiction, I’ve always claimed fiction as my first love and was quite suspicious of novelists who claimed they read more nonfiction than anything else. Now, I completely understand, as I find getting through most novels either difficult or slow-going, despite how much I may like one on whole. Tagged with ulysses, henry james, books, Nabokov, literature, James Joyce, the golden bowl, strong opinions. July 4, 2015 by Shane Eide.